Many of us were injured from time to time while playing sports as kids, and may assume the same will happen to our children. It’s almost an expectation with certain sports, especially those that are high-impact sports, like football. And many see it as a healthy trade-off: although there’s the risk of getting injured, there are also many benefits associated with sports. 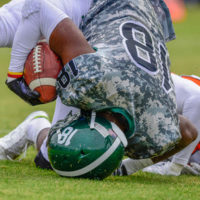 However, according to recent reporting from the New York Times, the effects of sports injuries can not only linger into the future, but they are potentially preventable. Reporting on a study recently published in Sports Medicine, experts indicate that preventing sports injuries in children requires that more of those involved in managing these sports take into account both the physical and physiological differences between children and adults, and make adjustments based on these differences. Why Do They Get Injured? Because their bones, ligaments, muscles and tendons are still growing, children are, overall, much more susceptible to injury in general. For example, what appears to be a sprained ankle could result in a serious growth plate fracture in a younger person. According to the experts, the most common injuries amongst young athletes involve overuse, which causes strain on certain body parts, muscle imbalances, and inadequate time for repair and recovery. Two common types of overuse injuries include Achilles tendonitis and shin splints. What Could Be Done Preventatively? For these reasons, coaches and others involved in youth sports should make greater efforts to protect children from injuries. This includes providing for a better system of conducting physical exams prior to participating in specific sports, as well as including a conditioning program and warm ups that aim to prevent injuries in that specific sport. It also includes making sure that the right protective gear is always provided—helmets, shin guards, body padding, etc., and never encouraging children to play through or ignore pain. Diversification—playing several different sports instead of just one—is also reportedly important so that the same areas of the body are not constantly in use. Some experts also recommend that children under the age of 16 not practice any one sport for more hours per week than their age in years. And then there are the internal issues to consider: Good nutrition is of paramount importance. Take vitamin D deficiencies, for example: children deficient in vitamin D are almost 4 times more likely to sustain fractures that require surgery. This also includes eating right, otherwise bones can suffer and bone stress injuries can result. If your child or a loved one has been injured due to someone’s negligence, contact our Fort Lauderdale personal injury lawyers at Friedland & Associates today to find out how we can help. Not every injury is just a “natural” part of playing sports.